Families are chock full of colorful characters, legends and tragedies. In our family, we have a famous science fiction writer, a skyjacker, Mayflower passengers, Revolutionary and Civil War soldiers, the founder of Brooklyn and many others. Genealogy research has its quotient of humble-bragging, and famous relatives and/or salacious tales are simply grist for the mill. As a child, none of my illustrious ancestors or distant cousins held much interest for me (OK, Cousin Gary, the skyjacker, seemed pretty badass, but we were specifically told never to speak of him). I didn’t know and didn’t care about the esoteric and (at the time) tedious details that somehow caused us to be related. Giant Dipper trains circa 1924. Note minimalist car structure. Walter Fernald Byrne was the exception. 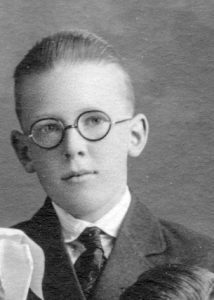 Known around our house as Uncle Fernald, though he hadn’t lived long enough to know any of his nieces or nephews, Fernald was my grandfather’s younger brother, the middle of three boys in a family of six Byrne children growing up in Santa Cruz, California. On September 20th, 1924, Fernald became the first person killed on the brand-new Giant Dipper roller coaster at the Santa Cruz Boardwalk amusement park. He was 15. Here was something to spark (and terrify) a child’s imagination, not to mention providing stories sure to impress one’s friends. 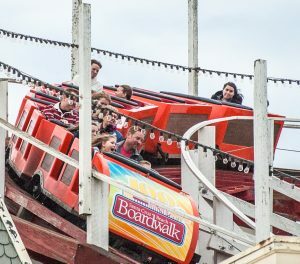 As family legend had it, Fernald had ridden the Giant Dipper repeatedly in rapid succession, and on his final ride recklessly stood up, causing him to somehow fall out of the train and plunge to his death. I remember my father being somewhat vague on the details, and my grandfather seemed uninterested and/or unwilling to recall the story when asked, which we did very rarely. It was family scar tissue best avoided, even as my brother and I grew old enough to ride the roller coaster ourselves during our monthly visit to my grandparents, who still lived in Santa Cruz. Fernald Byrne in early 1920s. A few years ago, I began looking into the details of Fernald’s short life. While researching family history at the genealogy room at the Santa Cruz public library, I came across accounts in the local papers of Fernald’s accident and the subsequent public inquest. The story largely aligned with family legend: Fernald had been riding the Giant Dipper with a friend during a weeknight school party. After three rides (initially reported as six), he was in the front car of the train, possibly standing as the ride neared the end. For some inexplicable reason, Fernald was thrown out and over the front of the train, which proceeded to run over him. A brakeman saw the incident unfold, and immediately applied an emergency brake, but it was too late. Fernald’s companion, a schoolmate, was too traumatized to give a coherent account of what happened. Today’s Giant Dipper trains, with enhanced safety gear. 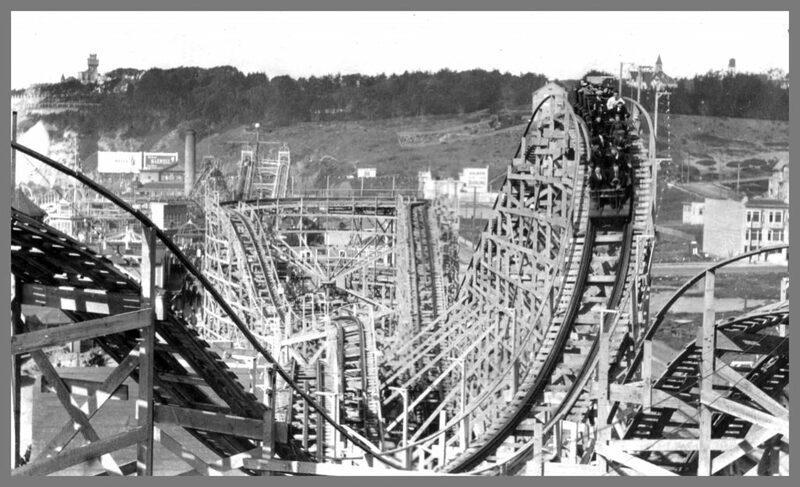 It’s worth noting that trains on the Giant Dipper were very different in 1924 than they are today. 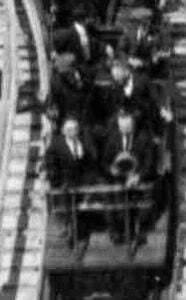 A close look at the feature photo above, taken early on in ride’s history, shows how open the cars were, with little in the way of safety or security features to hold passengers inside the train. Fernald died almost instantly from a crushed skull, broken neck and crushed chest. At the inquest were his father, Walter, who asked many questions about the safety and operating procedures of the operators, along with Fernald’s uncle, Ryland Drennan. The incident was simply ruled an accident, with no specific cause identified or blame assigned. Reading the news coverage of the accident brought to life the horror and tragedy of Fernald’s death in a way my grandfather never revealed. Fernald’s parents, extended family, and the larger community were bereft at the loss of this promising, smart and well-liked young man. While the legend of Fernald was compelling to me as a child, I’m now struck by the tragedy of his death and the devastation it brought to the family. It was heartbreaking. Perhaps my grandfather’s reticence to discuss it was due in part to his having been away at Stanford when the accident occurred. I suspect the more likely reason was it was too complicated and painful, more easily swept aside unspoken, as so many other things in his life. I appreciated reading this account. As a child I remember hearing this story from my mother, Ruth (Byrne) Anderson, a cousin. There were not many details, but it was a cautionary tale. Heartbreaking to put a face to this sad event! Thanks, Joan. You probably know your grandfather designed the house on Union Street for my gr-grandparents (my grandparents also lived there). We loved that house, and I’d always heard it was a project he designed while still a student at Berkeley, but have never verified that (would be fun to see if any record of plans still exist in UC architecture school archives). I have to say that I haven’t been on this site in a long time. My nephew Alex Anderson (William and Cassandra Anderson) messaged me asking for ancestry info for a Geography class project at HSU in Arcata. I started digging, and have spent a big chunk of this weekend looking through this wonderful collection of all things Byrne! My sister Mary had also sent me some Santa Cruz directories from 1916-21 that I perused. Sam and I were in Santa Cruz visiting our daughter Katie when she was completing her undergraduate work at UC some 15 years ago and he encouraged me to knock on the door of the house my mother Ruth was born in on King Street. The wonderful man who answered, on the faculty at UC, gave us a tour. I did not know that my grandfather also designed your family’s house. I will have to find a picture and will plan a drive by next time I am in Santa Cruz. We sometimes go over from Katie’s house with the grandkids. On a sadder note, my Aunt Bobbi (Roberta Maixner, child # 5, after my mom, of Walter G, passed last month and we are headed to Bakersfield for the memorial. She was 94. I will have to encourage my cousins to have a get together in Santa Cruz. That is where it all began, after all!